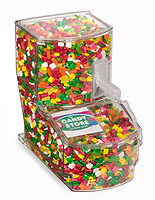 Hard plastic material for a long lasting display accessory. Gray coloring for blending in with a variety of settings. Coiled cord connects the spoon to the holder for easy organization. 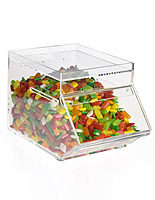 This unit is sold separately from acrylic bins and tongs. 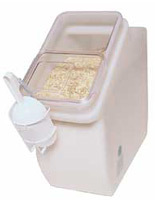 This scoop spoon with snap-on holster is sold separately from the scoop bulk food bins. 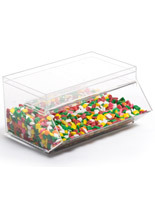 The unit is just an accessory for food storage bins and displays. 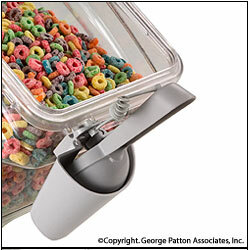 This scoop spoon and scoop holster easily attach onto the bins of your choice. Users need to simply clip the holster to the top of the storage unit. This scoop spoon is a wonderful choice for a variety of settings. 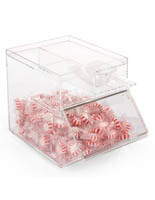 Restuarants, buffets, convenience stores, and other establishments where quick access to food is necessary choose this unit. 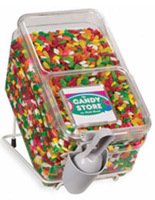 This scoop spoon is great to have with any bulk food dispenser, acrylic bin, or food display! 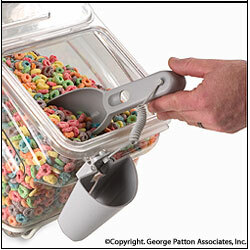 Allows for easy pick up of food out of the bin display. This scoop spoon is designed specifically for doling out dry foods. Cereal, candies, rice, beans, ice cream toppings, and other dry stuffs are wonderful choices. This scoop spoon attaches to the holster with a coiled cable. This cable provides organization, so customers do not walk off with the accessory. This scoop spoon easily fits right back into the holster after each use. The gray exterior is a neutral color for matching most restaurants and other eateries. This scoop spoon is made of hard plastic materials to prevent breakage under normal use. 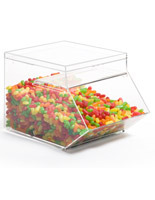 Attach one of these restaurant accessories to an acrylic bin to give customers easy access to their desired food stuff. 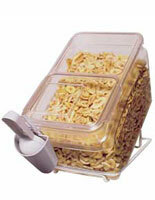 **Bulk scoop bin are sold separately. Tongs are also sold!